Green vs. Black Olives: What Is Healthier? When talking about the health benefits of olives, there is still a debate as to which is healthier, black olives or green olives. The basic difference is that green olives are picked before ripening, while black olives are picked after ripening. There have been a lot of studies that talk about the nutritional values of olives that seek to define the question: are olives healthy? Nevertheless, when talking about the health benefits of olives, there is still a debate as to which is healthier, black olives or green olives. The basic difference is that green olives are picked before ripening, while black olives are picked after ripening. Green olives are picked before they are unripe, soaked in a lye formulation, and fermented into a brine solution for six or twelve months before packaging. The monounsaturated fats and polyphenols in the olives aid in preventing oxidation of cholesterol. This helps in preventing cardiovascular diseases. Green olives in brine solutions have high sodium content as well. The most important antioxidant substances are vitamin E, polyphenols, and beta-carotene. Olives are rich in vitamin D, phosphorous, and calcium, which help in maintaining bone health. According to research published in Unani Herbal Newsletter, monounsaturated fats found in olives help one to reduce blood pressure. Another research published in the newsletter pointed out that green olives also helps individuals with anti-inflammatory benefits, especially during allergies. Black olives are an additional taste enhancer to dishes. Black olives are packed with iron, calcium and vitamin A. The polyunsaturated fats in black olives can help lower cholesterol and reduce the risk of a person developing type 2 diabetes. These fats are also good fats and can help decrease the chances of high blood pressure. According to the author of ‘The Encyclopedia of Healing Foods’, Michael T. Murray, “black olives might be useful in the treatment of asthma, arthritis and even cancer”. In addition to that, a study which was published in the Journal of Nutrition stated that black olives might be beneficial for curbing the growth of colon cancer cells. Raw olives have a bitter taste, as they contain an element called alkaloid, according to the California Rare Fruit Growers. After sun drying, one can consume black olives and enjoy their nutrition and health benefits. Some of the black olives that are brined contain greater amounts of sodium. The best way to consume these brined olives is to rinse them so that the amount of sodium in it is reduced. 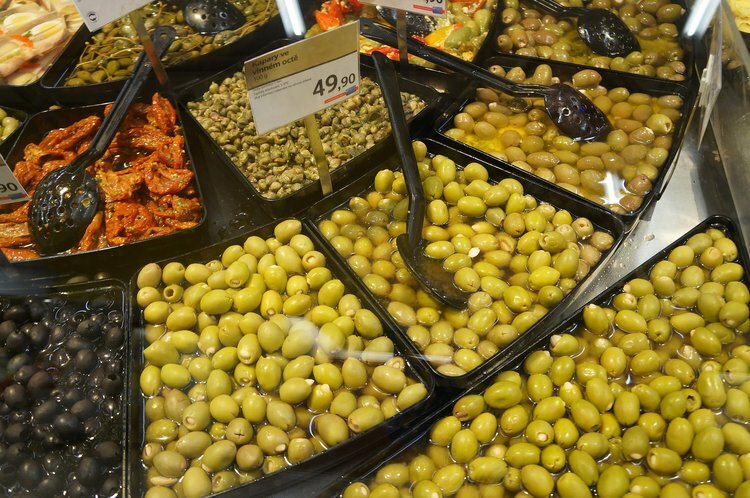 If nutritional values are taken into consideration, black olives and green olives do not differ by much. Both are packed with a variety of nutrients that keep the body healthy. When olives are cured, the sodium content is increased, hence why it is important to wash the cured olives, so that it reduces the salt content. Olives are a great choice for a healthy addition to a snack or meal. As a snack, salad ingredient, toppings for varied dishes, as spreads, and the like, both black and green olives are powerful and versatile with their health benefits. Rejano, L., Montaño, A., Casado, F. J., Sánchez, A. H., & de Castro, A. (2010). Table olives: varieties and variations. In Olives and olive oil in health and disease prevention (pp. 5-15). Ed. Academic Press San Diego, US. Casado, F. J., & Montaño, A. (2008). Influence of processing conditions on acrylamide content in black ripe olives. Journal of agricultural and food chemistry, 56(6), 2021-2027.